The Art of Communication is for anyone who senses that they could be communicating on a deeper level. Perhaps you are a confident communicator but suspect there may be more to the art of conversation that you have not yet been able to access. Or perhaps you feel that your conversations lack depth and meaning and that you'd like to enrich your relationships with others, if only you knew how. This book will address your concerns and show you how to engage wholeheartedly with others. There's more to conversation than just clear, rational thinking. Left-brain rationality is important, of course, but neuroscience increasingly shows that the right-brain skills of creativity, intuition and spontaneity are essential in good communication. In this guide, you'll discover ways of tapping into the full conversational potential that lies dormant within you, adding a level of nuance and watching the result as your relationships blossom. You may even find that untapped value in the form of new insights, ideas and creative thoughts, emerges from your daily conversations. 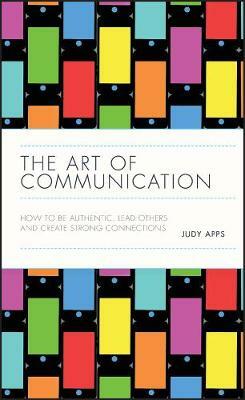 From communication guru and bestselling author Judy Apps, The Art of Communication will show you how to breathe life into your relationships and produce powerful new thinking enabling you to transform the world you live in.